Something like having Robocop and Sting live and in living color can't fail right? There's even a macho handshake kinda like Arnold Schwarzeneggar and Carl Weathers in Predator! That's gonna sell tickets! I know it is! Didn't turn out that way. During one of WCW's big PayPerView events promoted as the "Capitol Combat: The Return of Robocop", in Washington DC (a show that I gladly did not attend), the Four Horsemen locked Sting in a giant cage. Not a cage you'd put a dog in or something, but a cage that would be in a go-go dance club or something. So, Sting, helpless against the Horsemen's attack of locking him in a giant prop cage, needed the help of one man...no not Lex Luger, one of the Steiners, El Gigante, Oz, PN News or any other WCW star at the time. No. He need the sheer power of Robocop. The power of this half-man, half-machine, all badass was enough to break the Stinger out of the plastic cage and "Scare" the Horsemen through the crowd and out of this horrendous event. 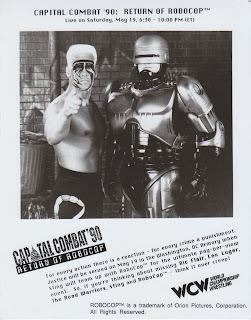 Robocop's appearance was hyped pretty well but he only showed up for a couple minutes, did nothing and lumbered back to the backstage area never to be seen in wrestling again. Yep. All the hype for this. It was extremely embarrassing, even for the time. WCW was known for crap like this from the time it got bought out by Ted Turner, it the time it closed. Despite all the promotion, hype and the promise of the big man himself, it ended in humiliation for WCW. And quite frankly, it didn't matter. The PPV stunk and so did Robocop 2. In fact, Robocop 2 was so atrocious, I'd wager to say people would rather watch this PPV event than the actual movie. The rest of the PPV had nothing of note and is wisely rarely discussed in the wrestling fandom. PS-In keeping with the reminiscing about early 90s WCW, I need to send my condolences to the family of the late professional wrestler Matt "Bourne" Osbourne who died today on Friday June 28th at the age of 55. Matt wrestled around this time in WCW as "Big Josh" and later as the first Doink the Clown. A true tragedy, as he was very talented and very respected. 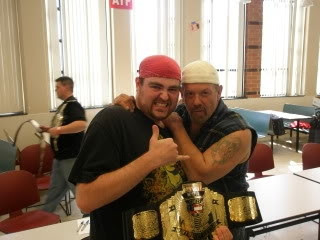 I got to meet him at a convention a few years ago and he was as nice as can be. He was even in his Big Josh gear. Thanks for the memories, Matt. You were one of the best. Thanks for everything, Matt. Rest in peace.